• Big Sean feat. E-40, "I Don't F--- With You"
• Iggy Azalea feat. Rita Ora, "Black Widow"
• Bobby Shmurda, "Hot Boy"
• Iggy Azalea feat. Charli XCX, "Fancy"
• Idina Menzel, "Let It Go"
• Jason Derulo feat. 2 Chainz, "Talk Dirty"
• John Legend, "All of Me"
• Chris Brown feat. Lil Wayne, French Montana, Too $hort & Tyga, "Loyal"
• Jeremih feat. YG, "Don't Tell 'Em"
• Luke Bryan, "Play It Again"
• Florida Georgia Line, "Dirt"
• Sam Hunt, "Leave the Night On"
• Florida Georgia Line feat. Luke Bryan, "This Is How We Roll"
• Paramore, "Ain't It Fun"
• Coldplay, "A Sky Full of Stars"
• Fall Out Boy, "Centuries"
• Romeo Santos, "Eres Mía"
• J Balvin feat. Farruko, "6 AM"
• Romeo Santos, "Propuesta Indecente"
• Romeo Santos feat. Drake, "Odio"
• Clean Bandit feat. Jess Glynne, "Rather Be"
• Ariana Grande feat. Zedd, "Break Free"
• Disclosure feat. 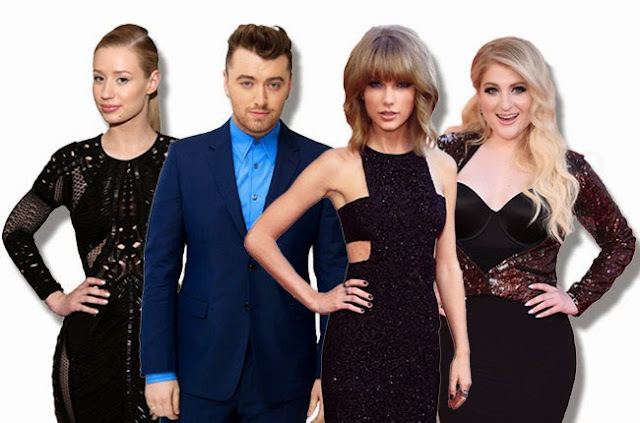 Sam Smith, "Latch"
• Hillsong United, "Oceans (Where Feet May Fail)"
• Francesca Battistelli, "He Knows My Name"
There were some powerful performances that lit up the stage at the Billboard Music Awards for this year ranging from the fiery rendition of “All Day” by Kanye West to the powerful and touching chords of Van Halen;s “Panama”. There were some really beautifully dressed stars that absolutely glowed in their evening attires and some malfunctions too, of course. An award show will always be incomplete without them. There were some hilarious moments too that will make the night memorable for everyone.